In 2013, the Norton family selected an historic farm site in Camp Verde, Arizona as for our future vineyard and winery. Over the next three years we planted just over five acres of vines compatible with our growing season, soils and micro-climate. Today, nestled in among pecan groves, pastures, small farms and produce stands, we are successfully growing six varietals. Primitivo, Montepulciano and Aglianico vines are planted in the former pasture where the soils are fertile and winter temperatures cold. Malvasia Bianca, Sangiovese, and Barbera vines are planted on the hillside where the soils are well-drained and the summer temperatures are warm. When we first contemplated starting a boutique vineyard and winery in Camp Verde, we were guided by lasting impressions from family visits to Italy. All agreed that the mosaic of vineyards, orchards, villages, mountains and rivers of northern Italy created an unforgettable “sense of place.” As such, we decided to plant Italian varietal grapes in an area of historical and contemporary small-scale agriculture. Tending these varietals reconnects us in a very personal way to a memorable place and culture. It also serves as a reminder that our goal at Salt Mine Vineyard and Winery is to create a place-based experience that integrates sustainable agriculture, scenic mountains, flowing rivers and streams, and a friendly small-town atmosphere. The migration of the Monarch butterfly is one of the most compelling and misunderstood migration stories in the natural world. Monarch butterflies, unable to withstand the winter cold in most of North America, migrate to the forests of Michoacan, Mexico, and the southern coast of California to overwinter and hibernate. It actually takes four generations of Monarchs to complete the round trip from Canada to Mexico! Unfortunately, due to loss of milkweed and overwintering forests, Monarch populations are in serious decline. In October 2014 Lisa Jansen, a volunteer for the Southwest Monarch Study, tagged a Monarch butterfly that emerged from a chrysalis collected at Salt Mine Vineyard and Winery. 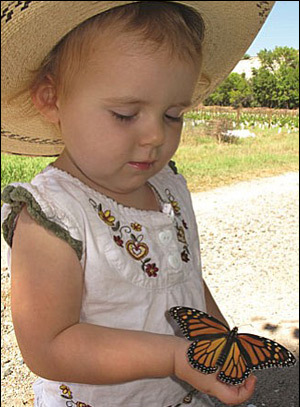 The Monarch was released by her 2-year old daughter Wren and videotaped by her husband Brian. The following year, the same tagged Monarch was discovered in the State of Michoacan, Mexico; 1247 miles from the release site! This wintering site is "the farthest known distance flown from a monarch tagged in Arizona," said Gail Morris, Southwest Monarch Study Coordinator. Recognizing that our vineyard is an ideal way station site, we are installing a perimeter drip system to propagate milkweed species that are essential for successful Monarch breeding and migration. Hopefully, this way station will help the recovery effort for declining western Monarch butterfly populations, and allow visitors an opportunity to observe and learn more about their remarkable journey! 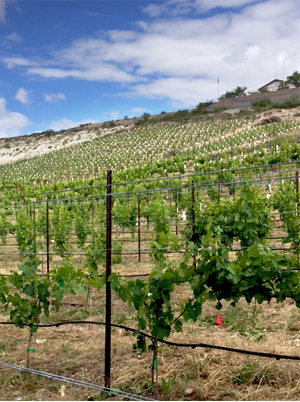 Malvasia Bianca, Sangiovese, and Barbera grapes are planted in the hillside vineyard. Wren with tagged Monarch at our vineyard.